On Sunday, October 14, 2012, the artists and students of Ryman Arts engaged children and adults in a fun and inclusive afternoon of drawing at the Grand Park in downtown Los Angeles, in association with Active Arts at the Music Center and Grand Park. Together, they created a drawing stretching FIVE city blocks from The Music Center Plaza to City Hall! 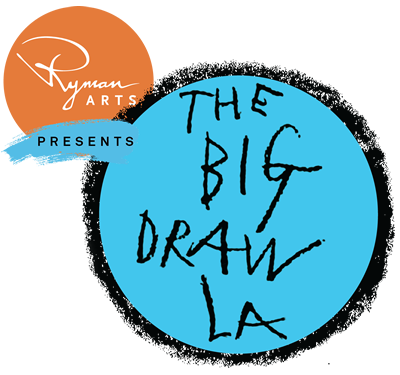 Below is the panorama from The Big Draw LA's 2012 afternoon at Grand Park as visualized by the community. And check out the previous Art in the Park panoramas as well! Art in the Park 2010 at Exposition Park! and Art in the Park 2011 at Exposition Park! You can see photos from the flagship event on Facebook. And, please check out the cool time-lapse video from Make Your Mark in the Park - click here! The comments made by young people at Make Your Mark in the Park, captured by Mobile Voices, say it all about the value of making art together! - Watch the video by Luis here.